I began playing guitar 49 years ago this month. 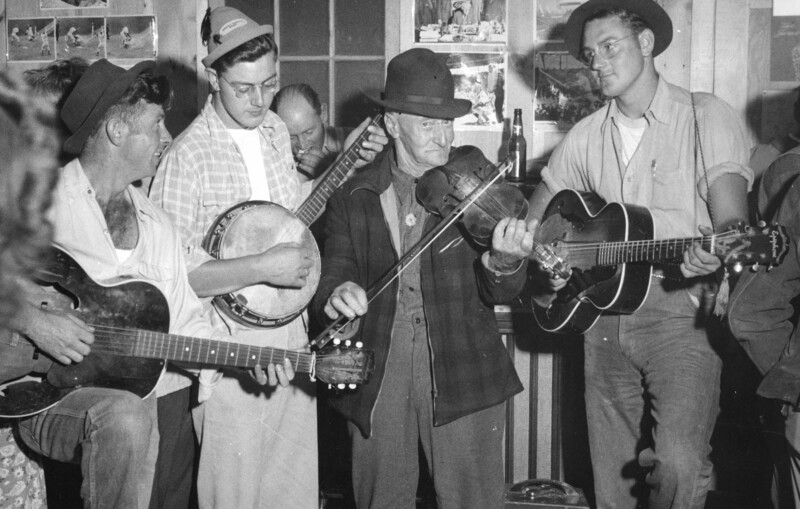 I learned from three pickers who began playing in the 1940’s. It was bluegrass, but also some music that is called old timey. My grandfather was born in 1872 and learned classical violin, but then he played the raw fiddle tunes popular after the civil war. I remember him playing one time when I was very small. That is him playing the fiddle in this photo. The other three young men were the ones who taught me ~10 years later. As a result, bluegrass and old timey have been part of my life in one form or another. Recently on YouTube I have found some homemade videos made in living rooms, etc. That brings back so many fond memories. When others in high school were dating, etc. I was playing guitar in somebody’s living room or garage. What a wonderful picture of your father and his friends! There’s a soft spot in my heart for bluegrass as I live in the southeast U.S. There is a certain joyful simplicity to that kind of music (although it’s far from simple music -grin-). Have a great day! Previous Previous post: So who won?